Chinese JuniperEvergreen shrub. The soft, gray-green foliage and short stature of 'Pfitzeriana Compa..
Chinese JuniperEvergreen shrub. Sculpted into a topiery shape. 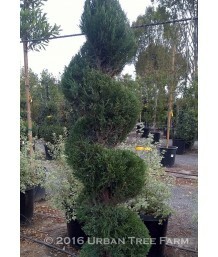 Tiered sprays of cool green, needle-l..
Chinese JuniperEvergreen shrub. Pruned into a topiery shape with two stacked globes. Moderate growth..
Chinese JuniperEvergreen shrub. Pruned into a spiral shape. Moderate growth rate. Dense foliage with..
Andorra JuniperEvergreen groundcover. Silver grey foliage grows on a densely-branched mound. Prized ..
Japanese Garden JuniperEvergreen shrub. Naturally low growing, mounding habit. Soft, rug like green ..
Calgary Carpet JuniperEvergreen shrub. Dense, low, spreading, habit. Slow growth but long lived. Fea..